While early looks at Shovel Knight led fans to draw correlations to the Mega Man franchise due to the title’s 8-bit charm and emphasis on fighting through enemy-infested stages in order to reach wacky stylized boss battles, the final product proves much more than an homage to the blue bomber. 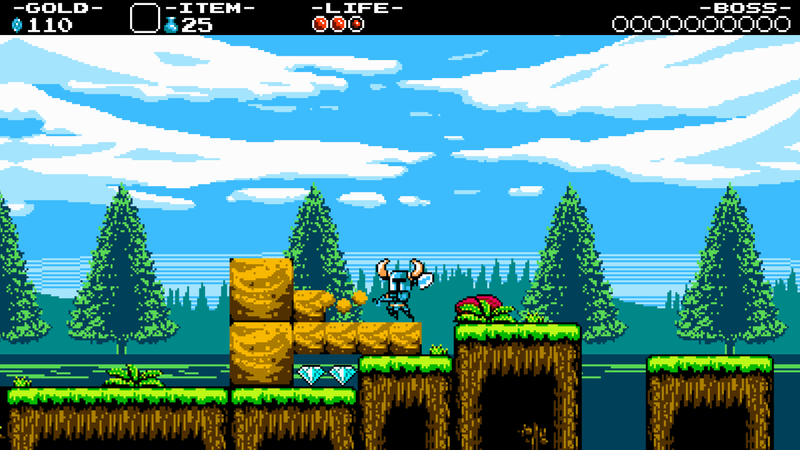 At the most basic level, Shovel Knight is Yacht Club Games paying tribute to NES-era titles and franchises that have largely shifted to 3D planes since. But inspirations drawn from Mega Man, The Legend of Zelda, the original Final Fantasy, Castlevania, and more are what allows this light-hearted fantasy platformer to work so well while simultaneously crafting an identity all its own. 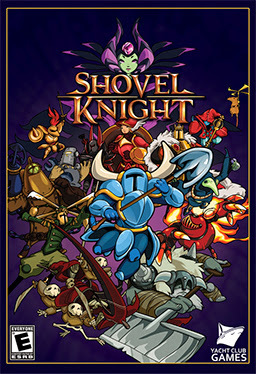 The story is that of Shovel Knight, long-since separated from his old partner Shield Knight, questing forth to challenge the evil Enchantress and her Order of No Quarter, comprised of eight key members, each of whom has a unique sprite design and battle tactic specific to their stage. Mole Knight digs into the walls and floor of his stage, springing forth to attack Shovel Knight with quick strikes. Specter Knight flings his rotating scythe around his arena of combat, Treasure Knight shoots his anchor cannon in an underwater environment, and so on. While a few of these boss encounters add environmental challenges to the mix, the matter of which fight will prove the toughest is largely a matter of what items players have on-hand. Within each major stage lies a new weapon or tool to be added to Shovel Knight’s arsenal, though these are often hidden in rooms that are a little ways off the beaten path. 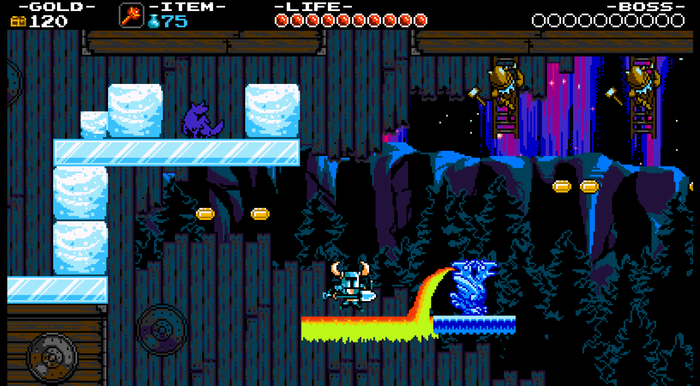 So while the only immediate reward for besting one of the bosses is progression to the next area of the overworld, should you miss any one of these items during your initial run through a stage, a gentleman named Chester who resides in the first town Shovel Knight visits will be willing to part with the Dust Knuckles, Flare Wand, Propeller Dagger, Throwing Anchor, and so on for a decent sum of treasure. Collectible music sheets can be sold to a bard in the same town, and then can be heard any time from then on. 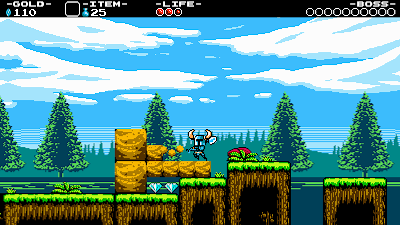 Upgrades can be purchased to boost both Shovel Knight’s health and magic meters, and a few shovel attacks can be added to his skill set as well. Around the midway point of the game, a handful of alternate armor sets will become available, each with its own unique properties, such as less treasure dropped upon dying, an emphasis on conserving magic in exchange for less damage protection, etc. This grants players a greater degree of freedom with how they wish to tackle the late-game challenges, as well as a higher degree of involvement and carefulness in decision-making going forward. Food items such as turkey and apples can be used to restore Shovel Knight’s health within a stage, but as these become less frequent in later stages, the two chalices available for purchase may prove more desirable additions to the inventory. The chalices are effectively the same as the bottles in The Legend of Zelda games – Shovel Knight need only purchase the chalices for a reasonable sum, then visit the Trouple King (a trout-apple hybrid creature who resides in a forest pond not far from the earliest stages) to fill the containers with one of three different healing/defense-oriented concoctions. 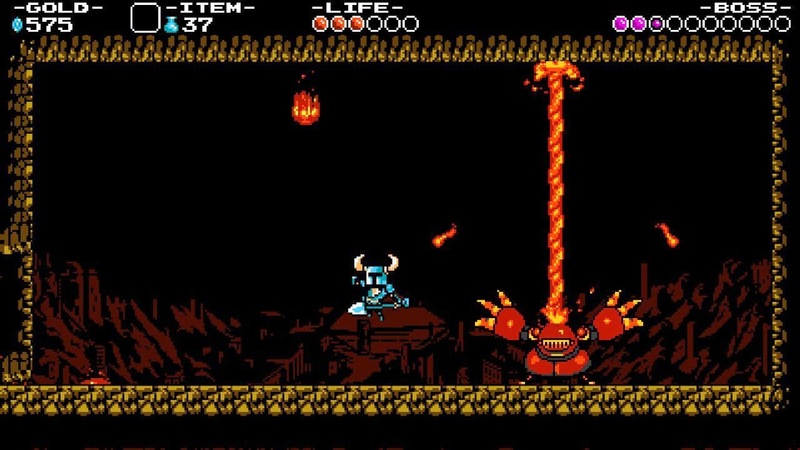 Should Shovel Knight lose all his health in a stage, fall off a cliff, or run into spiked flooring, the game will simply place the hero back at the last checkpoint and take away a small sum of treasure. This lost treasure can be retrieved, though depending on where in the stage Shovel Knight last perished, this may prove more of a gamble than some may feel is worth the trouble. Shovel Knight is not an easy game, per se, and it heavily emphasizes a trial-and-error routine. However, its responsiveness is quite fine-tuned, and the game deals out success and failure in a fair manner. Only at a few junctures do the hurdles feel significantly more so challenging, and even then, most can be more easily overcome with the proper equipment at one’s disposal. Beyond the core routine of tackling major stages and facing down the Order of No Quarter, Shovel Knight can take on extra challenges that emphasize treasure retrieval or square off against player-recorded ghosts in the Streetpass arena. A few wandering individuals, such as The Baz and Reize, offer extra battles that are fast-paced and intense, and may need to be overcome in order to reach the next portion of the overworld map. The order that events need to be tackled in Shovel Knight is only so concrete - while the main stages cannot be tackled in whatever fashion players see fit ala Mega Man, there is a certain degree of freedom that becomes greater the further along players progress. The soundtrack does well to evoke a classic fantasy adventure sound with peppy and upbeat tunes that harken back to the 8-bit era as much as the brightly-colored pixelated graphics do. 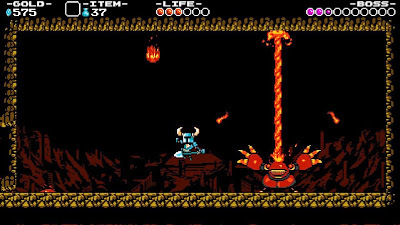 Shovel Knight is a rare breed – a game that knows its roots and takes plenty of inspiration from them, without identifying too closely with one or another. The game also does well to pace itself, keeping things interesting by offering up plenty of new challenges with each stage, but never extending itself to unnecessary lengths.